For those of us who avoid hospitals like the plague, unless we’re certain we have the plague, it’s always a surprise to find them staffed by people who show up willingly, even cheerfully, every day. Why anyone would choose to work surrounded by illness and death — not to mention needles and bedpans — is a mystery to us. 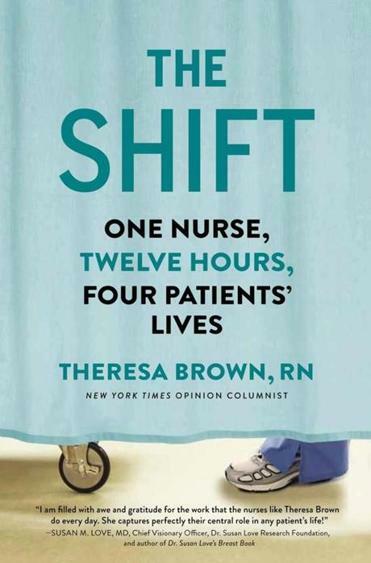 In “The Shift,” writer and registered nurse Theresa Brown takes a step toward solving the puzzle, pulling back the curtain on daily life in a busy oncology ward and illuminating the humanity beneath the hospital’s sterile surface. The book, Brown’s second memoir, spans a single 12-hour workday and highlights the many challenges of nursing: overwhelming patient loads and mountains of paperwork, tricky interactions with doctors who need input but expect deference, and the tightrope walk between overreacting to small changes in a patient’s condition and missing a subtle indicator that something is seriously wrong. It’s safe to say that Brown’s career arc is atypical. She earned a PhD in English and taught writing at Tufts before trading academia for scrubs at a Pennsylvania teaching hospital. She explains that nursing was her calling, although she describes it more as a rewarding job than an enjoyable one. Hers was a career change motivated by compassion and care. In the oncology ward, Brown treats patients who are otherwise robust and have a good chance of beating cancer as well as more vulnerable patients for whom the diagnosis is essentially a death sentence. Some who seem doomed to die defy the odds, however, while others, apparently healthy, sometimes take sudden turns for the worse. These unexpected turns remind nurses that, despite their elaborate protocols and high-tech equipment, they exert limited control over their patients’ fates. It’s a devastating revelation, and one that doesn’t quite sink in during nursing school: Nurses can do everything right and a patient can still die. It’s a lesson often learned the hard way in the hospital. “For me it was the patient who started coughing up blood and within five minutes was dead, just like that,” Brown writes early on. The specter of this possibility looms heavily over her account, building tension and giving weight to otherwise mundane tasks. What makes Brown’s story shine are the touching and sometimes bizarre moments that make real life in a hospital stranger than fiction. In one scene, a patient says a tearful goodbye before surgery, knowing there is a 20 percent chance the operation will kill her. Brown offers her a hug; the patient, instead, kisses Brown square on the lips. Another anecdote offers a glimpse of gallows humor while Brown attempts to fill out the paperwork required to discard unused pain medication following a patient’s death. The form doesn’t include “patient died” as an explanation for the leftover narcotics, however, so she chooses the closest alternative, “patient refused,” and can’t stop laughing at the absurdity. The narrative fabric itself turns strangely thin during moments that seem substantial, as when Brown briefly reports the death of a major character, asking rhetorically, “Do we need the details?” It’s a surprising time to be stingy with description, considering that the narrator has elsewhere vividly detailed everything from co-workers’ haircuts to the flavor of her lunchtime yogurt. A health-care columnist for The New York Times, Brown seems more at home using anecdotes to build arguments — in favor of lower patient-nurse ratios, less rigid hospital hierarchies, and a reduction in the red tape that takes nurses away from actual nursing, among other things. These are admirable goals, and Brown is able to make her case from the strongest possible vantage point: inside the hospital, where she is doing the work so few of us have the guts to do. Jennifer Latson is writing a book about Williams syndrome. Follow her on Twitter @JennieLatson.